I stole this idea from Jeff at View from the Cloud, but just in case you've been wondering what I've been doing with myself these past few months, here is what I can remember anyway. In honor of my friend that is fighting cancer, donated 11 inches of my hair to Locks of Love. 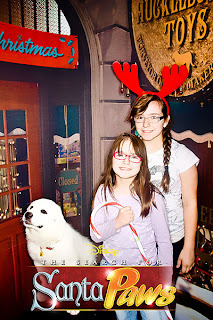 Took my girls to see The Nutcracker for the first time. They both loved it. We did not love the people who sat behind us, after coming in LATE, and the child talked all through the first act, while the MOTHER kicked my chair...we moved at intermission. Attended 3 holiday parties in two days. 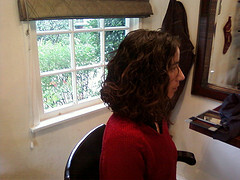 At one of them, a very sweet older woman was stroking my hair (obviously, before the locks were cut). It was mostly strange because she didn't ask permission first, which I totally would've given! Oh, and at another party, one woman went off about how much she didn't like the Toy Story movies. Are you serious? Do you HAVE a heart? Discovered AccuRadio and their multiple Broadway stations!! Moved office locations. Very strange because for once, I've had the same home address three Christmases in a row, and the office has been the one constant in the last 7 years. Adjusting. Very, very slowly. Celebrated with Sylvia. Along with the Peace Poster win, she just won a scholarship that will pay for her dance classes and clothes, etc. up to $2,500! Why yes, I am very proud, thank you! Attended PTA meetings, PAC meetings, helped out at a few events, gone to a few luncheons, gone to my leadership classes, read books for the leadership classes, accomplished all of my Xmas shopping online (even remembered stocking stuffers this year), taken the girls to see Harry Potter (or, as Riley likes to say, HP7), survived a parent teacher conference, survived Sylvia's finals, took a tour of a high school, solve challenges like how to be in two places at once (be at neither place), attend a happy hour night, a girls' night out night, negotiated agreements with government agencies, cut monthly expenses, slowly but surely paying down my credit cards, obsessively check my bank account balance, discovered Leverage, took the girls to Disneyland, laughed with the girls, cried with the girls, struggled with the girls, worried about the girls, think about the girls, talk about the girls, talk at the girls, talk to the girls, listen to the girls, try to teach the girls, learn from the girls, get mad at the girls, make up with the girls, love the girls. It sounds like you've been giving out a lot of love - in all the right places. Have a wonderful holiday with your girls! Sounds excellent. What an impressive donation, and go Sylvia! How could anyone not like Toy Story??? Sounds like it was packed full of good! Hope you had a very Merry Christmas! Whew! I'm tired just reading it all! The hair cut looks great. Such a great cause too. Awesome. Here's to another great year. 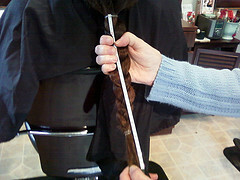 Wow, not only did you donate an amazing amount of hair to Locks of Love, your locks still look great. I did the same thing a couple years ago, but somehow ended up looking like Posh Spice (at the time). It sounds like you have your priorities in the right place!